All on its own at the end of a 1.2 kilometre-long beach, EcoSea Dive & Bungalows offers a chance to get away from the crowds, and dive into underwater journeys around the island. Just 10-minute walk from the village, they have their own pier, which the speed ferry stops at enroute to Koh Rong. They have a collection of fairly solid wooden bungalows looking out to sea, set back into the pine trees and a couple of dorms, one with hammocks, one with beds. The accommodation doesn’t necessarily stand significantly above anywhere else on this side of the island, but the location and the dive opportunities do. They also serve sushi in the restaurant. The seaview bungalows have ensuite bathrooms, glazed doors, giving you a gorgeous start to the day, and are simply decorated with wood-frame beds, mozzie nets and fans. 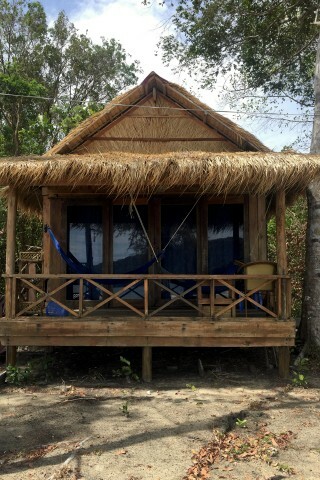 The jungle bungalows are cheaper without a view, and also have ensuites. Meanwhile, those on a budget can choose between a $3 hammock in an open-air dorm, or a bed in a closed building. The bar is the centre of everything here, and seems to generate a quiet buzz even during a mid-morning in low season. The restaurant is in a separate building, where they serve up everything from breakfast to dinner buffets and barbecues and Japanese, Western and Khmer food at prices from $3 to $7 for mains. Diving and snorkelling activities are provided by EcoSea Dive’s centre at the end of the private jetty. Eco Sea created an artificial reef just off the bay here in mid-2014 by (deliberately) sinking a boat. Prices for the rooms will change depending on whether you’ve signed up for any of the dive packages. For example, the dorm rooms are free for booked divers, the jungle bungalow low season price drops to $22, and the price for a low season seaview bungalow goes down to $35. Check rates at EcoSea Dive & Bungalows on Booking.com.